(Left) A gathered crowd watches Bevo Howard perform over Charleston Harbor. (Right) He’s shown in the early ’40s in the Piper Cub he flew for all five of his world championship wins. He was the first person in the world to do the tricky maneuver called an “outside loop” in a light plane. Heck, he regularly flew upside down with his arms dangling out of the cockpit before snagging a ribbon held between two poles. To the delight of thousands of Charlestonians, he once flew under the Cooper River Bridge, upside down. Among the top aerobatic pilots in the world, Beverly “Bevo” Howard (1914-1971) was a Holy City hero. As a teen growing up in Bath, South Carolina, he went to work at Hawthorne Aviation in nearby Augusta, Georgia, and purchased the company just a few years later. At the start of World War II, he won a military contract through which Hawthorne trained some 6,000 American and French pilots, and he went on to open flying operations all over the Southeast—including one in Charleston, where he would eventually reside. 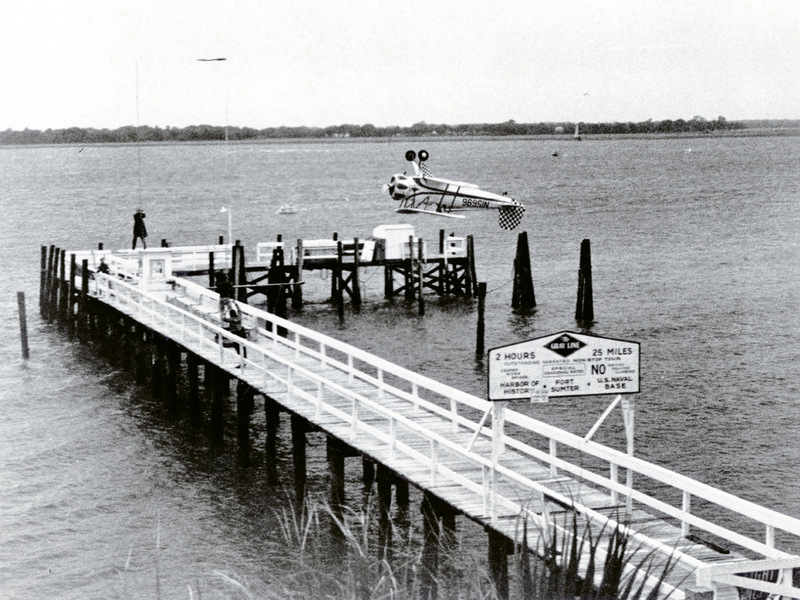 In this 1960s photo, Bevo Howard flies upside-down over Charleston Harbor in his Bücker Jungmeister, aiming to snag a ribbon hanging between two poles in a signature air-show stunt. The daredevil’s desire to give aviation a business-like image drove him to eschew the usual leather jacket, goggles, and white scarf and instead wear a dress shirt and tie while dipping, diving, and spiraling through the air. He won five world aerobatic championships—even before 1946, when he bought the extraordinarily aerodynamic Bücker Jungmeister that would become his trademark. An essential ingredient of his art was safety. 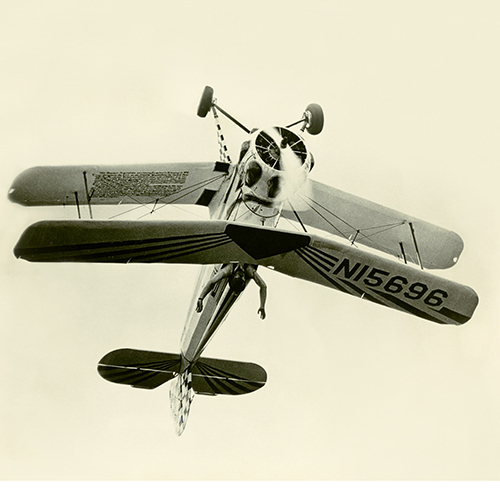 “If safety is lacking,” he told The Boston Evening Traveller in 1964, “you don’t have precision aerobatics—you have fool-hardy stunt flying that isn’t worth watching.” In fact, Howard may have only bailed out once in his career. After Charleston’s 1938 tornado, he was hired to fly photos of the storm’s destruction to The State newspaper in Columbia. Becoming lost in a low cloud near Orangeburg and losing control of his plane, he parachuted out. The plane crashed in a field, and, hitchhiking, he delivered the photos in time to make press. Famed for flying upside down with his arms dangling toward Earth, champion aerobatic pilot Bevo Howard was a hero here in Charleston. It was at a Greenville air show on October 17, 1971, that the consummate professional lost his life. He was moving into his final stunt when the Jungmeister’s engine failed. Its wing hit a tree, and the plane fell to the ground, killing him instantly. Fans remembered their hero with a memorial air show in Charleston on June 17, 1973. His plane, restored at Hawthorne Aviation, was on display and can still be seen today at the Smithsonian National Air and Space Museum’s Udvar-Hazy Center, in all its red-and-white-checkered glory.